Here is a set of Queen Holden's PEGGY AND PETER Large Paper Dolls. Large Peter and Peggy are 12" tall. They have 6 pages of uncut beautiful full color clothing. I am also including a tall Paper Doll that appears to be a Queen Holden. SLUMBER PARTY PAPER DOLLS - 5 young teens and adorable retro outfits! Plus they have smart dresses, sweater sets, coats, evening gowns and active wear—34 outfits in all, plus lots of accessories. SWEET 16 features 16 pretty paper dolls with classic 1940s fashions.The preppy and pretty blondes, brunettes and redheads are lucky young ladies who share a great big wardrobe. over 100 outfits for every occasion in a fashionable 16-year-old's fun-filled life. 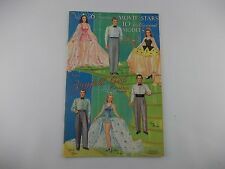 Lovely BETTY HUTTON Paper Dolls w/ Movie Costumes--AUTHORIZED ED--SPECIAL PRICE! This authorized paper doll, illustrated by Judy M Johnson, also includes a star bio by David Wolfe. From teen star to leading lady, Deanna Durbin was an audience favorite with her bright personality and sweet, clear singing voice. The pretty cover design by Norman Mingo features two dolls to go with eight clothing pages. CARNIVAL PAPER DOLLS - Wonderful dress-up costumes for 6 dolls! It’s a paper doll party! A super 1940s reproduction. 9 x 11 book with 6 pages of clothes, a 2018 reproduction of the 1943 book. When you wish upon a star you get 70 precious little outfits for nine sweet babies—Anne, Andy, Connie, Curt, Ruth, Richie, Midge, Letty and Binkie. Charming page designs make this retro reproduction even more delightful. and collectible. Travel the globe with children around the world paper dolls! This artful paper doll book is a treasure for collectors and youngsters alike. Two dolls and eight pages of clothes. Originally published in 1949, this quaintly charming, colorful, double-cover paper doll book has been reprinted by Paper Studio Press.Dress four sweet stand-up dolls in 16 old-fashioned outfits awash with ruffles, ribbons and bows--all in shades of pink and blue. ESTHER WILLIAMS Vintage Reproduction Movie Star Paper Dolls--SPECIAL PRICE! The glorious screen goddess, Esther Williams' splashy glamour starred in legendary MGM aquatic extravaganzas of the '40s and '50s. This is a reprint of a 1951 Whitman paper doll. Uncut and in new condition. There are no cuts, tears, or marks. 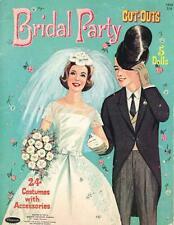 Uncut, includes 1-11 1/2" doll, 6 colored fashions and 6 Black and white. LITTLE MISS CHRISTMAS AND HOLLY-BELLE Reproduction Paper Doll Book--SO CHARMING! Also included, a history of paper dolls. The clothing pages are filled with a great wardrobe of clothes -- over 40 pieces in all -- with everything from beachwear to evening gowns. Photos of Judy are scattered throughout the book. Star biography by David Wolfe. Dover 1993 SPANISH GIRL AND BOY PAPER DOLLS by Kathy Allert. FIRST DATE Paper Doll Reproduction--8 Teenage Dolls w/ Stylish 1940s Fashions! It is also an authentic piece of fashion history as well as an example of our changing society. *NEW! * THE RANCH FAMILY Paper Dolls - A colorful wardrobe for the whole family! The whole family has fun on the ranch! Dress Mom, Dad, Lisa, Bud, Holly and Sis in a colorful western wardrobe, beautifully detailed with embroidery, fringe, conchos and plenty of plaids. A fun 1950s reproduction paper doll. JEANETTE MACDONALD Vintage Reproduction Paper Doll Book--SPECIAL PRICE! Jeanette MacDonald, singing sensation and top film star of the 1930s and '40s, is brought to life as a paper doll with 2 pretty Jeanette dolls and a gorgeous wardrobe of movie gowns. LINDA DARNELL. This is for a set of loose pages of uncut paper dolls and outfits. None of the dolls or outfits have been cut out. none of the paper dolls have been cut out. UNCUT PAPER DOLLS. PAPER DOLLS and OUTFITS. Pin-Up Queen BETTY GRABLE Vintage Reproduction Paper Dolls--SPECIAL PRICE! One of Hollywood's best known stars and pinup queens, Betty Grable, was the subject of many paper doll books. The red, white and blue covers feature pretty dolls, and the inside pages are nicely designed with well-drawn and painted clothes. Charlie Chaplin. Old-Fashioned Embossed Cut-Out. New ListingHedy Lamarr Paper Doll set. A reproduction from an Original Book. Hedy Lamarr Paper Doll set. A reproduction from an OriginalBook. New ListingDolls You Love to Dress, Paper Dolls Reproduction of a Saalfield set. Collector's Dorothy Lamour Cutout Paper Doll Set. Published by B. Shackman, 1999. New and factory sealed. The clothes pages are wonderful, with coordinating fashions for all occasions, 28 outfits in all plus accessories. 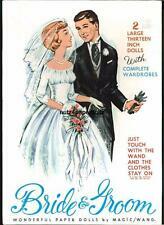 New ListingThe Honeymooners, a TV Paper Doll Book. Jackie Gleason. The Honeymooners, a TV Paper Doll Book. Jackie Gleason. This is a reproduction of a Lowe Book. New ListingThree (3) Pretty Girls Paper Doll Reproduction Book. Interpreted by Judy M Johnson ~ 1988. Printed in Hong Kong for B. Shackman & Co. This piece is Totally un PC and I love it. I've given several as gifts to "special" friends. 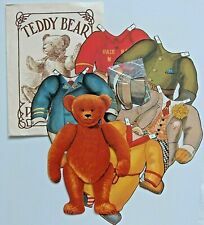 THIS IS A GREAT JOINTED PAPER DOLL! New ListingUmbrella Girls Paper Dolls Reproduction of a Merrill Publishing Book. New ListingCarmen Paper Dolls, Inspired by the Performance of Rita Hayworth. 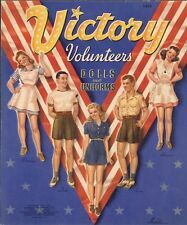 A beautiful 1943 reproduction paper doll book. Shirley Temple Paper Dolls. Dover, 1988. The Latin beauty, Rita Hayworth, is featured in the reproduction of the gorgeous 1942 paper doll book. The cover illustrations by Norman Mingo showcase her lovely features and dancing ability. The inside pages by Clara Ernst are beautifully designed with a wonderful wardrobe of clothes and accessories, beautiful backgrounds and star photos. So much sweetness in one special book!